-Cuts the maximum corporate tax rate to 21%. -Eliminates the corporate Alternative Minimum Tax. -Reduces or eliminates certain business deductions. -Provides a 20% deduction of qualified business income for pass-through entities. The qualified business income, or QBI, deduction is taken “below the line” in its own category, which means it does not reduce adjusted gross income nor is it subject to itemized deductions limitations. It also does not reduce income for purposes of the net investment income surtax, the Medicare surtax, or self-employment tax. The tax act was passed quickly, without much attention to detail. Thus, many provisions were unclear. To be implemented properly, the ambiguous provisions must be interpreted by the Internal Revenue Service or, in some cases, must be amended by Congress. Waiting for Congress to take action could prove futile for the 2018 tax year. However, the IRS has been issuing regulations, beginning with what might be the most complex area of the new law: the QBI deduction, provided under Internal Revenue Code Section 199A. This article will address the new QBI deduction, focusing on the requirements and complexities. It should be noted that additional guidance has been issued related to REIT dividends, publicly traded partnerships, forming multiple entities to avoid QBI deduction limitations, separating out “nonservice” activities from service businesses, and other specific aspects of section 199A. Before the new tax laws, C-Corporations paid tax at the maximum rate of 35% to 38%, with the AMT kicking in at 20% when excess deductions were claimed. Now, the maximum corporate tax rate has been reduced to 21% and the corporate AMT has been eliminated. Congress wanted to also give a break to businesses not operating as a C-Corporation. Rather than reducing their tax rates, pass-through entities may receive up to a 20% deduction based on their qualified business income. The key word is may. Due to income limitations and numerous other requirements, the QBI deduction might be limited or nothing. To claim the QBI deduction, the business must operate as a pass-through entity, have QBI, and survive the numerical calculations. It is not necessary to change business structure to be classified as a pass-through entity. Essentially, any business that is not structured as a CCorporation is a pass-through entity. This includes sole proprietorships, partnerships, multimember LLCs, single-member LLCs, S-Corporations, trusts, and estates. The QBI deduction cannot exceed the lesser of 20% of QBI or 20% of taxable income. The QBI amount is determined based on business income only, while the taxable income limit is based on the individual taxpayer’s taxable income. Qualified business income includes only income from a U.S. trade or business. Income from dividends, interest, capital gains, or rental income does not qualify as QBI. However, rental income will qualify if the property is rented to a related trade or business under common control or if the rental activity meets the definition of “trade or business” under Internal Revenue Code Section 162. For purposes of the deduction, QBI must be reduced by “reasonable” compensation paid to owners. If the S-Corporation does not pay owner-employees wages based on market value compensation, the IRS can impute compensation. For example, let’s say that Ben and Jerry are equal owners of an S-Corporation. The company nets $500,000 in 2018 before their wages of $20,000 each. If fair compensation is $100,000 each, the company’s QBI would be $300,000 rather than $460,000. For LLCs and partnerships, QBI is reduced by guaranteed payments to partners—but reasonable compensation is not required. Taxable income, for QBI deduction limitations, is based on the taxpayer’s taxable income, regardless of filing status (single, head of household, married filing separate, or married). The taxable income, as reported on the tax return, is after adjustments to gross income and itemized/standard deduction and does not include capital gains. 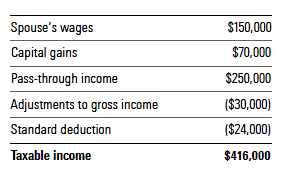 Adjusted taxable income would be $346,000 (reduced by capital gains). The QBI deduction would be limited to the lesser of 20% of QBI ($150,000) or 20% of adjusted taxable income ($346,000). Thus, absent consideration of further limitations, the QBI deduction would be $30,000. Calculations of the QBI deduction also depend on whether the business is classified as a service business or nonservice business. In general, high-income taxpayers will receive a larger benefit if the business is not classified as a service business. -Trading or dealing in securities, partnership interests, or commodities. -The principal asset of the business is the reputation or skill of an employee or owner. Engineering and architectural firms are specifically excluded from the definition of service businesses. Includes the provision of medical services by physicians, pharmacists, nurses, dentists, veterinarians, physical therapists, and other similar healthcare professionals who provide medical services directly to patients. Health services do not include services not provided directly to patients or services that are not directly related to the medical field. Such excluded businesses are health spas, payment processing, medical research, and the manufacture or sale of pharmaceuticals or medical devices. Includes services by lawyers, paralegals, legal arbitrators, mediators, and similar professionals. The performance of services not requiring skills unique to the field of law are excluded, such as printers, delivery services, and stenographers. Includes services provided by accountants, enrolled agents, return preparers, financial auditors, and similar professionals. To be classified as an accounting service business, the provider does not need to be licensed; i.e., a certified public accountant. The field of accounting does not include payment processing or billing analysis. Includes services provided by actuaries and similar professionals. However, businesses not included in this definition are services by analysts, economists, mathematicians, and statisticians not engaged in analyzing or assessing the financial costs of risk or uncertainty events. Includes the performance of services by individuals who participate in the creation of performing arts, such as actors, singers, musicians, entertainers, directors, and similar professionals. Not included in this definition are services that do not require skills unique to the creation of performing arts, such as the maintenance or operation of equipment or facilities, or the provision of services by persons who broadcast or otherwise disseminate video or audio of performing arts to the public. Includes services that are defined as the provision of professional advice and counsel to clients to assist the client in achieving goals and solving problems, including lobbying activities. It does not include performance of services other than advice and counsel, nor does it include consulting that is embedded in, or ancillary to, the sale of goods if there is no separate payment for the consulting service. Note that this is a vague definition, and the IRS states that a determination will be made based on “all of the facts and circumstances” of a person’s business. Defined similarly to performing arts services. It includes the performance of services by individuals who participate in athletic competition such as athletes, coaches, and team managers. It does not include the maintenance or operation of equipment or facilities, or the provision of services by people who broadcast or disseminate video or audio of athletic events to the public. Includes businesses that provide financial services to clients including managing wealth, giving financial advice, developing retirement plans, developing wealth transition plans, and providing of other services regarding valuations, mergers, acquisitions, dispositions, restructuring, or raising capital. It excludes banking services, such as taking deposits and making loans. Includes services in which a person arranges transactions between a buyer and a seller with respect to securities for a commission or fee. The definition includes services provided by stockbrokers but does not include services provided by real estate agents and brokers, or insurance agents and brokers. In defining businesses where the principal asset is the reputation or skill of an employee or owner, the IRS is taking a very narrow view. According to the regulations, this classification only applies to businesses receiving income for endorsing products or services; licensing or receiving income for the use of an individual’s image, likeness, name, signature, voice, trademark, or any other symbols related to the individual’s identity; or receiving appearance fees. It should be noted that the regulations provide some relief from this classification if the above-described income is a small part (5% to 10%) of another nonservice business. As above, the basic deduction is simply the lesser of 20% of QBI or 20% of adjusted taxable income. However, for service businesses, the deduction is reduced or eliminated based on the amount of adjusted taxable income. If adjusted taxable income is less than $315,000 for married taxpayers or $157,500 for singles, the QBI deduction is allowed in full. If adjusted taxable income is above $415,000 for married taxpayers or $207,500 for singles, the deduction is disallowed. For income levels in between those amounts, the deduction is phased out. The phaseout will be discussed in more detail later. -50% of W-2 wages (not including reasonable owners’ compensation). -25% of W-2 wages plus 2.5% of qualified property. It should be noted that W-2 wages for calculating the QBI deduction are not straightforward; wages paid to employees are considered for the 50% deduction, while “reasonable” wages or guaranteed payments to owners are not. For example, using Ben and Jerry’s S-Corporation example, let’s say that the taxable income of $460,000 is net of the owners’ salaries of $40,000 and wages of $180,000. Neither the $40,000 wages nor the $200,000 of “reasonable” wages for Ben and Jerry would be included as “W-2 wages.” Thus, the 50% of W-2 wages would be $90,000. Of course, the actual deduction cannot exceed 20% of QBI or 20% of adjusted taxable income. It is possible that 25% of W-2 wages plus 2.5% of qualified property could produce a higher deduction than 50% of W-2 wages. So, it is necessary to understand the definition of qualified property for purposes of the QBI deduction calculation. Essentially, qualified property is the unadjusted basis (without depreciation but reduced for Section 179 expense) of tangible, depreciable property that is used in the business at any time during the year. For service businesses in the phaseout range, the amount allowed is based on the greater of 50% of W-2 wages or 25% of W-2 wages plus 2.5% of qualified property. For example, let’s say the Ben and Jerry’s business is a service business. Jerry’s share of the company’s QBI is $150,000, which would entitle him to a QBI deduction of $30,000 (20% of $150,000). As a single person, Jerry’s adjusted taxable income is $177,500 ($20,000 above the $157,500 limitation but not above $207,500). Thus, 40% of specified service income would be excluded from QBI ($20,000 divided by the $50,000 phaseout range). Assuming that Jerry’s share of the 50% of wages, $45,000 (his share of $180,000 wages paid times 50%) is greater than 25% of wages plus 2.5% of qualified property, his potential deduction would be limited to $9,000 (20% of $45,000). This is a difference of $21,000 (the potential deduction of $30,000 less the limited deduction of $9,000). Because he is subject to a 40% phaseout, his reduction is only $8,400 (40% times $21,000), leaving him with a QBI deduction of $21,600 ($30,000 less $8,400). It should be noted that once service business owners have adjusted taxable income in excess of the top limits, no QBI deduction is allowed. For nonservice business owners with adjusted taxable income in excess of the top limits, the QBI deduction is limited to the greater of 50% of W-2 wages or 25% of W-2 wages plus 2.5% of qualified property. Thus, high-income taxpayers have a risk of losing the QBI deduction altogether if their business is classified as a service business. -Maximize itemized deductions, such as charitable contributions. -Maximize pension, 401(k), and IRA deductions. -Maximize adjustments to AGI (for example, choose a low-deductible self-employed health insurance plan rather than a high-deductible plan). On the other hand, to the extent the QBI deduction is limited to 20% of taxable income, some business owners might need to increase taxable income. In this case, deferring itemized deductions, minimizing retirement contributions, and minimizing AGI adjustments could all be strategies for maximizing taxable income. Because one of the limitations applicable to the deduction is the amount of QBI, maximizing QBI is important. Decreasing wages or guaranteed payments to owners can effectively increase QBI. As noted, for S-Corporations, owners’ wages cannot be less than reasonable compensation. However, an S-Corporation that is paying owners’ wages in excess of “reasonable compensation” might consider reducing such wages. In the case of an LLC or partnership, guaranteed payments are not required to be “reasonable,” nor are they required at all. Thus, QBI can be maximized by minimizing or eliminating guaranteed payments. For nonservice businesses, most of the QBI deduction will be based on W-2 wages. Instead of using services of independent contractors, nonservice businesses might want to consider hiring employees. For businesses that at least partially base the QBI deduction on qualified property, it is advisable to skip Section 179 expense. This is because the cost basis for QBI deduction purposes is reduced by Section 179 expense, but not depreciation. Additionally, purchasing assets rather than leasing can also increase the qualified property limitation. It might make sense to consider alternative forms of conducting business. For example, rather than operating as an S-Corporation, an LLC might prove more beneficial. This is because an S-Corporation’s QBI is reduced by owners’ reasonable compensation, whereas an LLC (or partnership) is not required to make guaranteed payments to partners. Because of the complexities and limitations of the QBI deduction, some businesses might want to operate as a C-Corporation. However, the cost/ benefit impacts of double-taxation versus the QBI deduction must be determined. This article originally appeared in the October/November 2018 issue of Morningstar magazine. To learn more about Morningstar magazine, please visit our corporate website.